In September 2010, 152 former workers from GP's Huizhou factory all with excessive cadmium levels won their lawsuit against Gold Peak Ltd. The court found in favour of the workers' claim for RMB 6.03 million cash compensation. Apart from the 152 workers who filed the claim, the award also included a further 110 workers with excessive cadmium levels who did not file the lawsuit but were in a similar situation. 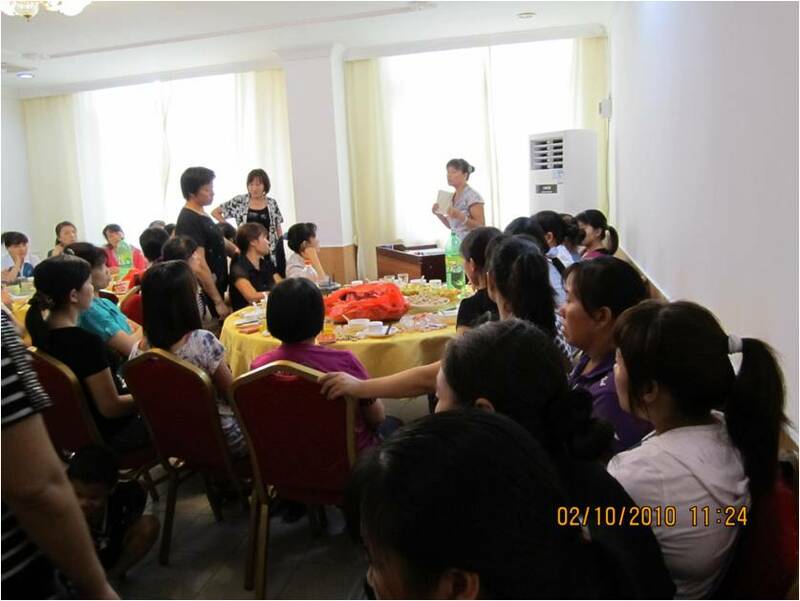 Each worker received between RMB 15,000 - RMB 25,000 making it the largest amount of compensation awarded since 2004. Most of the workers involved consider the award a victory. At the time of writing, the total compensation won by the GP workers amounts to more than RMB 50 million. Inspired by the compensation package GP won by affected workers following the closure and relocation of GP's Jet Power plant in 2009, the 152 workers filed their claim on 27 January 2010. In June 2010, the lawsuit came to a stalemate and both the court and the Huizhou government insisted that GP and their former employees negotiate an agreement. However, on 19 August 2010, GP left the negotiation table leaving the workers with little option but to organise collective action. 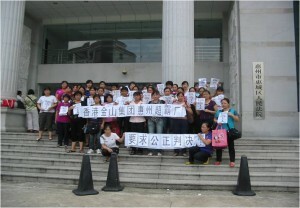 During the following weeks, the workers petitioned the GP plant, the court and the city government office and occupied the Huizhou City Petition Bureau for two weeks. 1. The amount of compensation will be based on the Shenzhen Jet Power compensation package. 2. The annual checkup for the affected workers will continue until 2014. 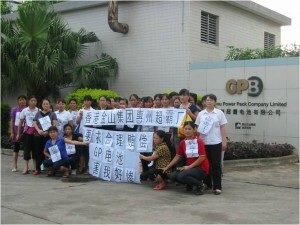 15 August 2010 ex-GP workers demand compensation in front of GP plant in Huizhou. While many workers consider the compensation a significant victory, a minority believe that the final agreement is an "unfair agreement" because it overturns GP's previous commitment, made in 2004, to take full responsibility for the health of adversely-affected former workers for the rest of their lives. The current agreement terminates annual checkups on cadmium levels after 2014 in what is a clear violation of GP's original commitment. The current practice is "annual checkup and immediate treatment of cadmium poisoning and reimbursement". However, after 2014, the workers have to pay for their own checkups. If their health is problematic, they are required to inform GP and apply for diagnosis first before getting medical treatment. That means it will become more difficult and take longer time for workers to get medical treatment and reimbursement. In addition, some of the workers' major demands have not been included in the agreement. For example, GP are not required to contribute to the social security scheme (a maximum of 15 years) for the affected workers, so that in the future if the workers have health problems at least they will get some medical protection. The workers will continue to fight for this demand. 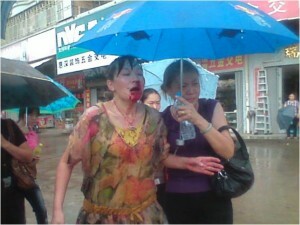 One of the injured workers Ms. Yang is helped to go to hospital for treatment by a fellow worker after the attack. The attackers remain at large. 2 October 2011, 90 GP workers take part in a celebration dinner. Worker representatives summed up the experience over the past six years and reminded everyone that the success was not accidental but down to workers' sweat, tears and blood as well as courage and persistence. 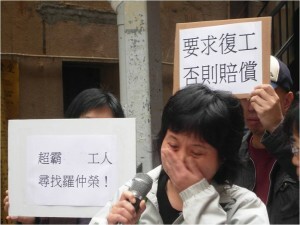 On 31 December, 2009, GP fired Ms. Wang Fengping without compensation on the grounds that she had violated the regulations of the GP factory rulebook. Ms. Wang petitioned GP's headquarters in Hong Kong in early 2010. In early 2010, Wang Fengping also filed a court case against the Public Security Bureau of Huizhou City. The PSB locked up on an administrative 10-day detention order on the wrongful grounds that Ms.Wang had gathered crowds to disturb public order. The charge resulting from a demonstration organised by workers from two GP plants in Huizhou on 9 December 2009 striking against GP's salary system. The PSB detention led to GP's decision to fire her. On 15 February 2011, the court finally revoked the detention order and she sued GP RMB 259,830.5 for compensation for wrongful dismissal. On April 15, Wang won the case awarding her RMB 192,700 in compensation. However both GP and Wang have appealed. Wang Fengping was an engineer at Huizhou GP and had worked there for 16 years before being fired. In October 2004 when the cadmium poisoning case broke out, her medical checkup arranged by GP confirmed that she had excessive cadmium levels in her urine. However, a month later, a second examination showed that her levels were back to normal. Two years later, she began to feel sick and went to hospital to have a thorough checkup - she was shocked by the results. Doctors told her that she was suffering from chronic kidney failure - renal atrophy. Wang believes that her kidney failure was caused by exposure to cadmium in her working environment. However, the medical reports made by the OSH institutions never informed her about it. She was told that medical report only once with excessive cadmium levels is no problem. Since 2006, Wang has demanded that her ex-employer GP and the OSH institutions many times to provide evidence to confirm her chronic renal failure is caused by her work so that she can use them to demonstrate that her illness was caused by her exposure to cadmium. During April 2011, approximately 200 workers with excessive cadmium levels came back to Huizhou for their annual body checkup. The experience over the past few years shows that the annual medical examination is an important measure to monitor and pick up workers whose previously excessive cadmium levels have deteriorated to levels that constitute "cadmium poisoning". Moreover it helps to identify workers with previously normal who develop to return to "excessive cadmium levels" again. This shows that capping the year of medical checkup to 2014 is not realistic. The argument is: all affected workers with similar situation will get same compensation. To enjoy pension for life after retirement, workers have to contribute to pension scheme at least 15 years before retirement. The workers demand GP the pay their pension scheme up to 15 years so that they receive better protection after retirement.